How to implement "Lean Thinking" in a Business: What is all the fuss about 5S anyway--Is it really important? What is all the fuss about 5S anyway--Is it really important? If an individual took a checklist with them and investigated all the different "versions" of the 5S's out there we would have about 10 or 20 different S's. 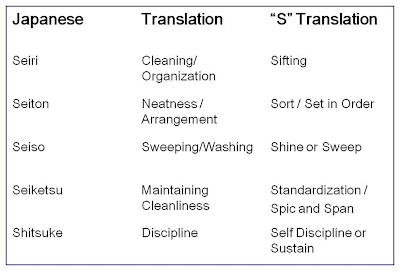 In my experience I've seen different words used in the place of the "original" 4S approach (american culture added the 5th S by the way) established years ago in Japan. The "version" I like to use comes from the original TPS Handbook created by Toyota Motor Corporation (TMC). So what is 5S and Standardization have to do with one another? 5S supports Toyota concept of "abnormality management" by applying visual techniques (visualization) and controls that enable a team member to immediately recognize the standard and any deviation from it. We can also call this Problem Identification, which is the first step in Problem Solving. The 5S condition on the shop floor or in the office can effect our ability to manage those 4 Key Performance Indicators (KPI's) -- Quality, Safety, Productivity, and Cost. Here is a helpful guide below to determine the different levels of knowledge when it comes to 5S "thinking". Where is your understanding as a company or an individual in regard to 5S? 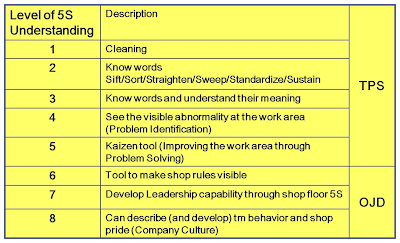 If a company is really trying to change their culture in regard to Lean and using TPS tools then 5S can be a way to develop team members as shown above. Remember 5S is a "visualization and standardization" tool that used to implement Lean (TPS). It can also be used as a development tool for leadership as well as team members across all levels of the company. So the next time someone asks about 5S just know its more than the "flavor of the month". I like this post very much. It help me to solve some my work under my director’s requirements. Hello, my name is Tracey Richardson,my email address is - traceyr@gmail.com ---- Im a Lean Thinker with 29 years experience in the field. I am the author of The Toyota Engagement Equation. I worked at Toyota Motor Manufacturing KY in the Plastics Department from 1988-1998. I have over 460 hours training in Toyota Methodologies and Philosophy, I am the co-owner and founder of Teaching Lean Inc. Im also on the faculty at the Lean Enterprise Institute! Follow me @tracey_san on Twitter or connect on Linkedin! Always "Go Thinking"!